The Healthy Hoff: The Healthy Hoff Graduates! I couldn't wait to be done with college, but for some reason since I graduated, I just can't seem to stop taking classes! 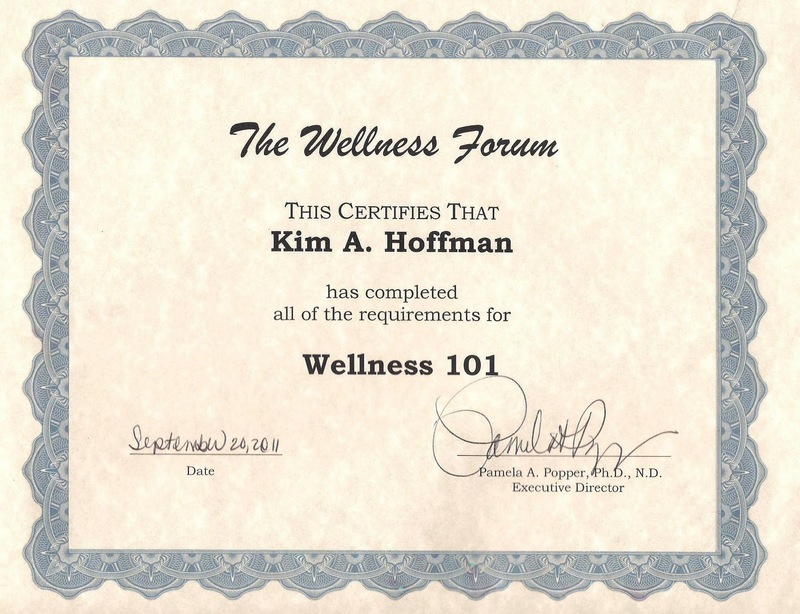 My latest endeavor has earned me a certification in a program called, Wellness 101 from The Wellness Forum in Columbus, Ohio. "Wellness 101 takes a thorough look at the science of diet and health and the skills needed to adopt a program of dietary excellence (tm) and optimal habits." In other words, you won't get opinionated information with this course, what you will get is scientific based facts and it's hard to dispute science. I found this course very interesting and picked up a lot of great tips to work into my lifestyle. The book was an easy read and the accompanying DVDs of live class lectures helped to reinforce what was being taught. I also enjoyed the weekly lecture calls that give you an opportunity to speak directly with Dr. Popper, who by the way, teaches the course. Weekly Conference Calls and Workshops - topics ranging from sports nutrition to cancer prevention and treatment. Members-Only Website - in addition to recipes and other helpful information, you'll have access to a growing library of workshops, Conversations with Dr. Pam and Conversations with Chef Del are posted for you to listen to any time! Free Shipping on orders over $250, within the continental U.S. Ongoing Support to help you in filtering and making sense out of the enormous amount of information about health you're exposed to every day! 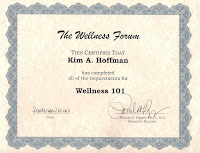 The Wellness Forum was founded and is headed by Dr. Pamela Popper, whom I had the pleasure of meeting. I found Dr. Popper to be quite knowledgeable and very straightforward in her approach to health and wellness. It helps that she runs in the same social circle as Dr. John McDougall creator of the McDougall Health and Medical Center, Dr. Caldwell Esselstyn of The Cleveland Clinic and Dr. T. Colin Campbell, author of The China Study - three medical professionals of whom I hold high regard for. While classes are taught at their Columbus facilities, I was fortunate enough to take advantage of their distance learning program. In other words, you don't have to live in Ohio to take this program. In fact, there were students from around the country in my class, including a few from Vegas. The class lasts six weeks and covers a lot of material that can be directly applied to your life. So, if you're interested in ways to make your lifestyle a little healthier or are just confused about all the conflicting health info out in the world today, check out The Wellness Forum, you won't be disappointed.